A Virtual Desktop Infrastructure (VDI) environment is used in some organizations where security and compliance issues are especially sensitive. Their users do their work on a virtual desktop containing all their desktop applications and files using Remote Desktop Services or a similar remote connection. Since Teams on the virtual desktop has not been optimized to access or use the audio or video devices on the user’s local device (without additional software), working in a VDI environment will usually have challenges related to multimedia scenarios such as calling, video calling, screen sharing, app sharing, co-authoring, and more. Organizations can choose to run Teams fully in VDI (using either the Web App or Desktop Client) but it is recommended that the following policies be turned off, so users don’t have a poor experience in a virtualized environment. Note that it can take some time for these policy changes to propagate. If you don’t see changes for a given account immediately, try again after a few hours. The CsTeamsCallingPolicy cmdlets enable administrators to control whether calling and calling options in private and group chats are enabled or not. AllowPrivateCalling Controls whether the Calling app is available in the left rail of the Teams client or not. Also controls whether users see Calling and Video Call options in private chat. Set this to False to remove the Calling app from the left rail and to remove the Calling and Video Call options in private chat. 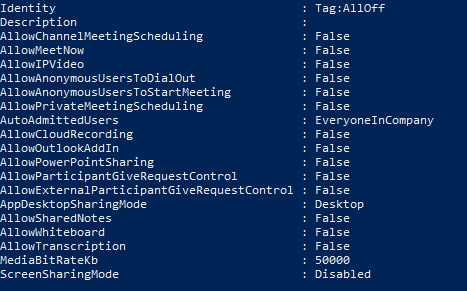 The CsTeamsMeetingPolicy cmdlets enable administrators to control the type of meetings that users can create or the features that they can access while in a meeting. It also helps determine how meetings deal with anonymous or external users. AllowPrivateMeetingScheduling Determines whether a user would be allowed to schedule private meetings. Set this to False to prohibit the user from being able to schedule private meetings. AllowChannelMeetingScheduling Determines whether a user would be allowed to schedule channel meetings. Set this to False to prohibit the user from being able to schedule channel meetings. AllowMeetNow Determines whether a user would be allowed to create or start ad-hoc meetings. Set this to False to prohibit the user from being able to start ad-hoc meetings. ScreenSharingMode Determines the mode in which a user would be allowed to share screen in calls or meetings. Set this to Disabled to prohibit the user from sharing their screens. AllowIPVideo Determines whether video is enabled in a user’s meetings or calls. Set this to False to prohibit the user from sharing their video. AllowAnonymousUsersToDialOut Determines whether anonymous users are allowed to dial out to a PSTN number. Set this to False to prohibit anonymous users from dialing out. AllowAnonymousUsersToStartMeeting Determines whether anonymous users can initiate a meeting. Set this to False to prohibit them from initiating a meeting. AllowOutlookAddIn Determines whether a user can schedule Teams Meetings in Outlook desktop client. Set this to False to prohibit a user from scheduling Teams meeting in Outlook client. AllowParticipantGiveRequestControl Determines whether participants can request or give control of screen sharing. Set this to False to prohibit the user from giving, requesting control in a meeting. AllowExternalParticipantGiveRequestControl Determines whether external participants can request or give control of screen sharing. Set this to False to prohibit an external user from giving, requesting control in a meeting. AllowPowerPointSharing Determines whether PowerPoint sharing is allowed in a user’s meetings. Set this to True to allow. Set this to False to prohibit user from sharing PowerPoint files in a meeting. AllowWhiteboard Determines whether whiteboard is allowed in a user’s meetings. Set this to False to prohibit whiteboard application in a meeting. AllowTranscription Determines whether real-time and/or post-meeting captions and transcriptions are allowed in a user’s meetings. Set this to False to prohibit transcription and captioning in a meeting. Joining meetings created by others. Even though the above policies restrict users from creating meetings, they will still be able to join meetings sent out by other users. Within these meetings, their ability to share video, use WhiteBoard and other features will depend on whether the admin disabled them or not. Issues related to cached content. If the virtual environment that Teams is running in is not persisted (data is cleaned up at the end of each user session), users might notice performance degradation due to the client having to re-download all content again, regardless of whether the given user accessed the same content in a previous session. This performance impact can be mitigated by using roaming cache solutions, such as those provided by FSLogix. [UPDATE] After escalation this to Citrix, they are going update EULA. To summaries the issues, According to the XenDesktop Platinum Feature matrix, it clearly lists CloudBridge VPX as a included features, but if you read the FAQ for XenDesktop Licenses, it states that you can only deploy this in your Branch office for free and not in your Datacenter.. This is in my belief is false advertising, as the product brochure states that a features is including in the purchase of the software, but the FAQ states different. Also, how is Datacenter defined. Also, there is NOTHING in the EULA for either XenDesktop or CloudBridge. There is a Official Citrix Blog advertising discussing Branch Repeater which is the old marketing term states it’s all free and included. I am just documenting this so that it saves someone else wasting time.. I personally believe, if you purchase XenDesktop Platinum you are entitled to deploy the CloudBridge VPX anywhere you like as the EULA does not state anything and does not define a Datacenter.. That is a generic term, it won’t hold up in Court. This is just false advertising. According to the Citrix XenDesktop Feature Matrix: – https://www.citrix.com/go/products/xendesktop/feature-matrix.html. XenDesktop 7.6 includes CloudBridge VPX for WAN optimization significantly improves XenDesktop and XenApp capacity and performance over the WAN while providing a unified platform that accelerates applications across public and private networks, resulting in superior application performance and end user experience. Does this include a license to run the Branch Repeater VPX in the central data center? As long as you are delivering XenDesktop Platinum (virtual desktops) over WAN links optimized by Branch Repeater VPX instances, you can run the included Branch Repeater VPX at any location, including your data centers. You may also chose to use the included virtual appliances with a mix of separately purchased physical appliances depending on your bandwidth at the datacenter and branch offices, and scalability and availability requirements. be used in the data center? But, the EULA for XenDesktop and CloudBridge VPX – http://www.citrix.com/buy/licensing/agreements.html Does not state anything about this clause.. So this is false advertising, either Citrix should update the EULA and deleted the blog or provide the ability to deploy in the Primary data center as per the original advertising. performing actions that negatively affect other users, for example installing applications, changing system settings and restarting the operating system. There is also the potential that a single user could consume an unfair share of resources, which may negatively affect other users. The hosted shared FlexCast model is provided by Citrix XenDesktop in combination with MicrosoftRemote Desktop Services (RDS). desktops remove the requirement that applications must be multi-user aware and support server based operating systems. logon. Changes to the desktop image are lost upon reboot. desktop image are lost upon reboot. stored in a personal vDisk and retained between reboots. 3rd party desktop management tools. is used to provide the Local VM FlexCast model. streamed (offline support) via Microsoft App-V.
>> goal is to explain the 3D Graphics for Virtual Desktop solutions, qualifying questions, remoting protocols, notes from the field, benchmark applications etc. >> A ‘ smackdown’ around “Application Virtualization solutions” such as Microsoft App-V, VMware ThinApp, Spoon etc. >> VRC: unbiased and independent research around bestpractices and performance impact of various solutions in Server Hosted Desktops. Impact AntiVirus solutions in VDI, Impact Application Virtualization in VDI, Windows XP/Windows7/8, RDSH/RDVH, HyperV/XenServer/vSphere, Virtualization of RDSH roles. Total more than 2500 tests have been executed and results are written in multiple whitepapers.